This update is intended to add some flavor to the world and make it feel a bit more lively. We’ve added several new creatures to the upper parts of the world, particularly on the surface of the far side of the planet as well as relatively shallow underground. We’ve also added some new areas to explore (and a new boss) that are related to the new creatures. You will need to generate a new world from the sandbox menu or create a new character to see much of the new content. We also changed the method of obtaining the Level 2 keycard upgrade – The upgrade device is now found in [spoiler]the captain’s room in the Pioneer Station barracks. [/spoiler] This update is fairly light on the direct story content, but the next update should expand on the story and the mysteries of the planet quite a bit. We re-worked the cooking/food system quite a bit. 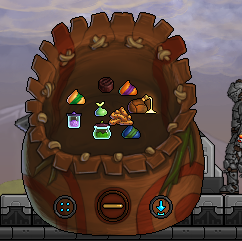 Prior to this update only a handful of food items had buffs associated with them, but in this update we’ve added buff effects to most of the foods. All fruits, mushrooms and meats now have buffs that you can get by eating them. 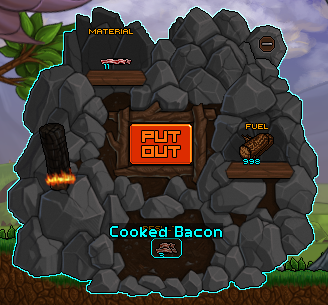 In previous versions, you’ve been able to cook food by using the crafting menu, but now cooking is done similar to how ore is processed. We’ve added pop-up menu when you right click the campfire, and you can both cook food and process ores in the same devices. The campfire has just one slot for ingredients, but the brick oven and advanced smelter both have 2 slots, which allows you to combine some food items to create new recipes. For example, a Juicy Fruit will give you a heal over time and a sporepod mushroom will temporarily increase your max health. Both items will fill 1/4th of your stomach, but if you cook them together you can make a food item that will give you both buffs and still just fill 1/4th of your stomach. You can also cook a fruit with a plant fiber to make Fruit Chews, which give you longer lasting buffs that fill less of your stomach. Some of the new creatures can inflict a bleed status effect on you, so we added Primitive Bandages (can be made with plant fiber) and Cloth Bandages that can stop the bleeding status. In addition, you can add some medicinal herbs to the cloth bandage in order to make a Poultice Bandage that heals you. All of these recipes are obtained by destroying matching projects that are in the world with your wrist laser. All gem upgrade recipes require 2 instead of 3 gems. We will probably eventually change this back once we have more sources for gems in the world. Most of these new status effects are currently attached to various food items. Bleeding – Slow damage over time, which can be cured by using a bandage. Inflicted by blow darts. Fixed some issues where certain sounds would play at full volume regardless of distance. Let us know if you notice any other sound fx that seem too loud. Fixed some issues that would cause certain tooltips to not appear when they should. The world generator may get stuck while generating worlds. We think we’ve fixed all the cases where this can happen, but we can’t be completely sure that there are no more lingering issues. If you run into this issue, definitely let us know. This entry was posted in Uncategorized on May 30, 2017 by Alex. Happy Halloween! Some kind of spooky comet has been seen in the sky, and it seems to have resulted in some kind of Halloween related weirdness! You should find a stack of seeds for the new pumpkin bush and a random mask in your inventory, and we’ve heard sightings of weird ghost-like energy beings that can be found on the surface of the planet. We’re still hard at work on the next larger content update, but we decided to do a small Halloween update in the interim because Halloween is probably the best holiday. As usual, let us know if you run into any problems or if you have any suggestions. We changed the Flying Javelin to a Flying Harpoon, which fires darts with the alternate fire. This is unrelated to Halloween. This entry was posted in Uncategorized on October 30, 2016 by Alex. The primary goal with this update was to change the combat balance and armor/weapon progression to be more satisfying across the length of the game. This update is light on the new content because we’re still working on the next major content update, but we figured we should go ahead and put out the balance changes in the meantime. Previously, armor provided percentage damage reduction, which meant early armor sets protected very little, the high level armor sets ended up providing far too much protection, and going from one tier to the next didn’t feel very satisfying because gaining a few percentage points of defense at a time is really boring. The new system uses flat damage reduction, so if you pick up a helmet that has a defense of 3 it will just prevent 3 damage, which might not seem like a big change but it allows us to make the progression much more satisfying and each new tier of armor or weapons should feel like more of an upgrade. There is a cap on the defense though, and you will always take at least 25% of the damage that is dealt to you. These changes required tweaking the balance of pretty much everything in the game. Most creatures have more health, most weapons do more damage, and we’ve changed the way armor piercing works so that individual weapons can have specific armor piercing values. We’ve done a significant amount of testing, but with all the combinations of creatures and weapons we have I’m sure there will still be some balance issues, so let us know what you think. We’re definitely not done tweaking the combat balance, but we decided now was a good time to start making some big steps towards a better system. The weird pink eyeball creatures can now only spawn spikes on appropriate block types. Also reduced their initial spawn rate. Changed quick slots to use Z/X instead of Q/E by default, and changed the default dodge behavior so that Q/E make you dodge left/right. 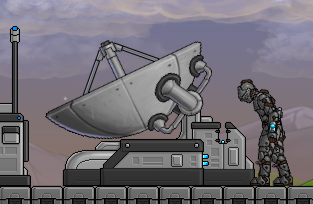 During world generation, the area between the mining base and Pioneer Station have been cleaned up a bit. This means fewer spikes, etc. Tweaked some bits of the Pioneer Station and Mining Base. Nothing major, but we’re working on fleshing them out a little bit at a time. You can now click quick slots in order to select them while the inventory menu is closed. Sheared sheep now drop 1 piece of wool when sheared post-mortem instead of 0. Fixed some cases where certain energy bonuses wouldn’t stack. Let us know if you see more. This entry was posted in Uncategorized on August 15, 2016 by Alex. We decided to celebrate Independence Day in the best way possible, by adding more things to Signs of Life that explode in a brilliant and dangerous fashion. For this special holiday update, we added several fireworks and stuffed a Fireworks Party Pack into everyone’s inventory, filled to the brim with instruments of pyromaniacal delight. This entry was posted in Uncategorized on July 4, 2016 by Alex. Added a gross eyeball creature to the areas near the spiky bosses. Added a Python revolver that has an alternate fire that allows you to fan the hammer and quickly unload all the remaining bullets in the cylinder. Added [REDACTED] Device – [REDACTED] mark a location and then [REDACTED] a portal that [REDACTED]. Added [REDACTED] – A pedestal that is activated by [REDACTED], and [REDACTED] your [REDACTED] when right clicked once activated. [REDACTED] when you die. Fixed an issue with particle effects that was causing them to look more muted than intended. The majority of particle effects should now look better. Added ability to change materials in crafting, for example you can now choose between using a normal or rubber stick in many recipes. Some recipes also let you change the primary (first) material, which can change the crafted result, for example now there is just a “torch” recipe, and you can change the result from a normal sap torch to a biofuel torch by changing the primary material from sap to biofuel. We only adjusted a few recipes, so let us know if you have more ideas for places we could use this feature. Double Tap – How it worked previously, double tap forward to dodge roll forward, double tap back to backjump. Binds Only – Only activates when you press the key bound to dodge, dodge rolls forward if you’re moving forward, backjump if you’re moving backwards or standing still. Bound to Z by default… but honestly that is a terrible bind and we’re trying to find a better one, but its tricky to find something that we’re not already using that can be easily pressed while doing other actions. Still working on this. Added ability to tweak various balance settings for creatures and melee weapons through a text file located in your game install directory (The directory should be something like Steam/SteamApps/Common/Signs Of Life/Content/CSV) Note: I don’t think the projectiles file works yet, so don’t be surprised if tweaking that doesn’t do anything. This entry was posted in Uncategorized on June 23, 2016 by Alex.